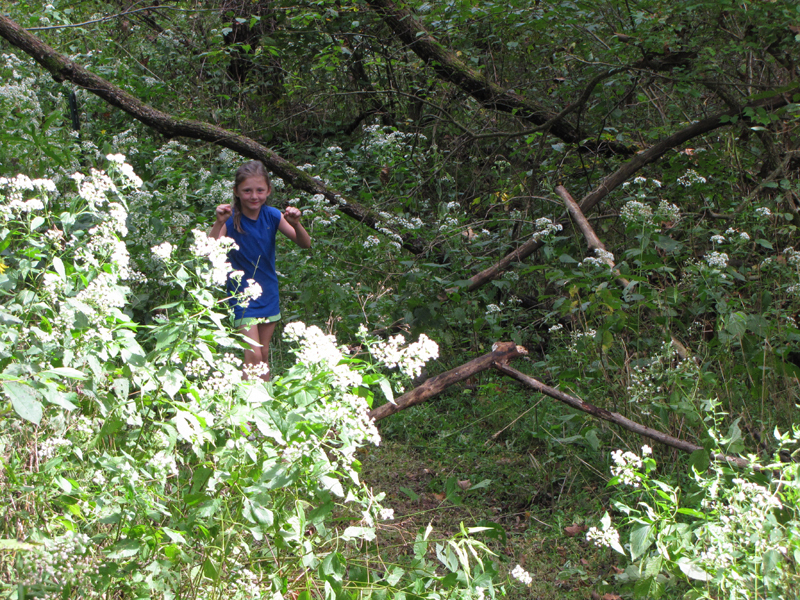 Fortunately, our property is ideal for constructing a short obstacle course for a child. It’s 1.5 acres with woods, a steep hill, and plenty of room to run. I started her in the woods at the bottom of the hill. 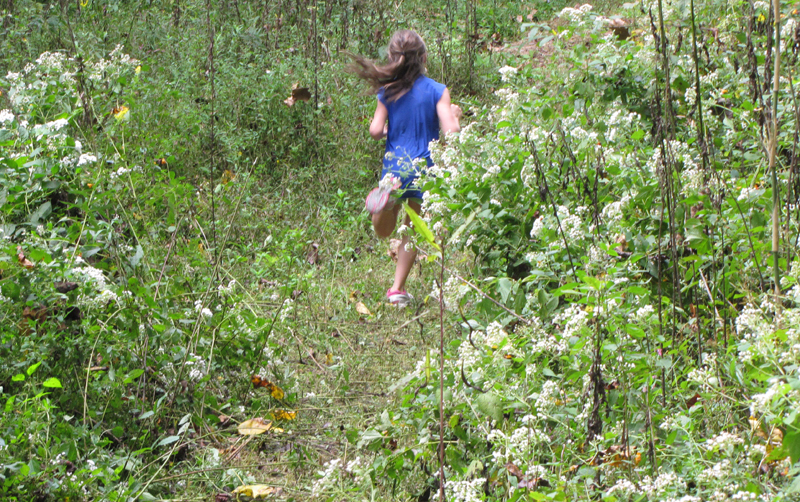 She had to run under 2 branches stacked against each other, sprint to the corner of the property and then traverse the “hill”. Because of the recent rain and the deer that use it for a path, the hill was muddy and slippery (sound familiar Spartans?). Once she reached a plateau, she had to climb up the slide attached to her playhouse. 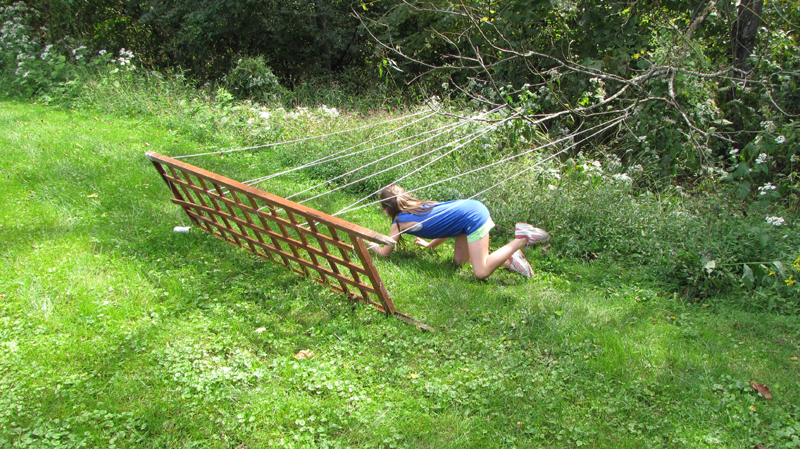 Run some more and then crawl under my makeshift “barbed wire” obstacle, which was made from twine. Out of that and then run under a series of tree limbs. The fun was just beginning as she then had to pick up a rock (approx. 7 lbs) and carry it about 50 feet up another hill. I could notice her starting to tire after that. She then ran to the driveway and through 2 sets of agility ladders. From there, it was a balance walk across a series of small planks. She fell off (just like I did at the Beast), so she got a burpee penalty. I only made her do 5, but first had to show her how to do them. 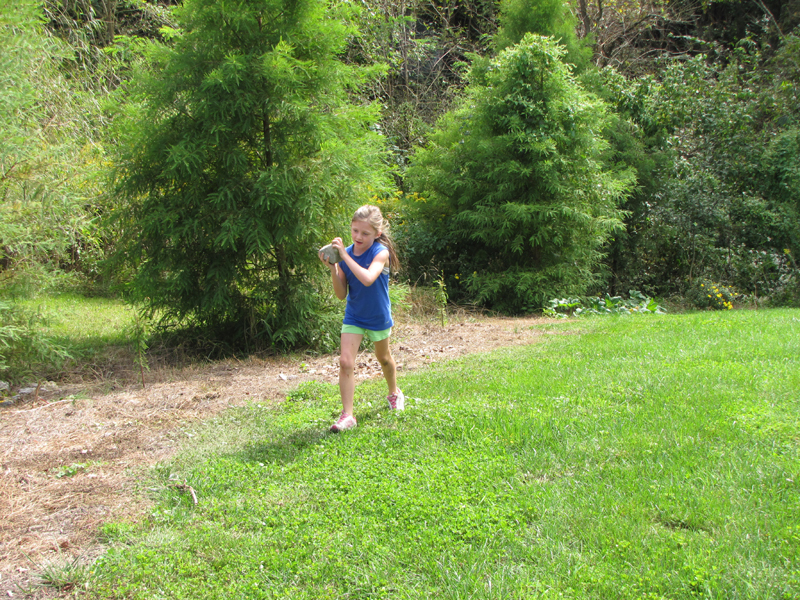 Then it was run across the sidewalk and down the hill through the water sprinkler. 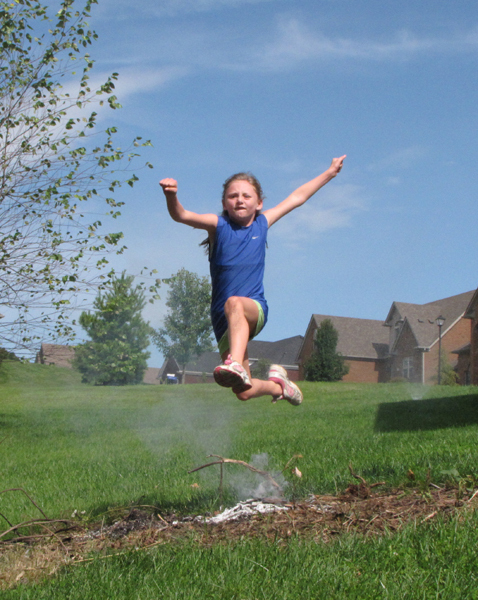 After that, it was the scary part for her…the fire jump! I had started a small fire before she started the race and at first it was burning slightly higher and hotter than I was comfortable with, but by the time she reached the jump it was down to embers. 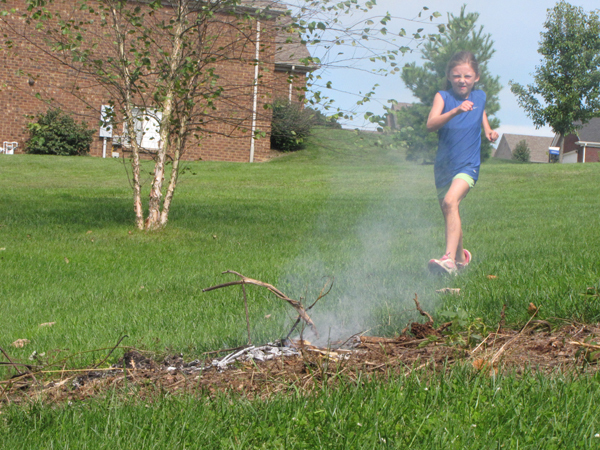 I was so proud of her as she ran with determination and leaped over the fire like a deer! Almost finished….run down the hill some more, jump over a log, and then face the “gladiators” (my wife and I) before running on to the finish line. I think it was a pretty good course for her because she was panting with hands on knees. She also had no desire to do it again that day. Below are some of the pictures, but keep in mind that I was playing the roles of race official and photographer, which meant I was running with her, directing her, and trying to take photos all at the same time. Three more weeks and she will be an official Spartan Chick kid! She really, really, really wants a Spartan Chick shirt so I’m going to have to convince someone to make her one. Reminds me of a young Margaret Schlachter! Leaping (not jumping) over the fire! This is the best thing EVER!!! I love this! Wow that is awesome. I really like the sprinkler and fire jump photos. That look of determination on her face is priceless . Im going to have to create an obstacle course for my son now :-). This is so much fun. We are going to do an obstacle race bday party for my so next month. He has been looking forward to it for a while now.